Of all the high CBD, Low THC strains on the medical marijuana market this one is King! 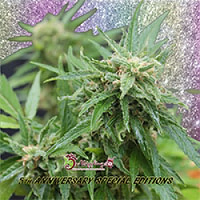 CBD Extreme 20:1 (CBD:THC) Feminized Cannabis Seeds by Sensible Seeds Premium Selection: Of all the high CBD, Low THC strains on the medical marijuana market this one is King! Precise testing in the laboratory showed CBD levels as high as 20.6 % and the THC less than 1% making this the most sought after CBD strain ever. The low THC will mean the " high " will be removed rendering the cannabis plant non-psychoactive and the extreme high CBD will give maximum health benefits. 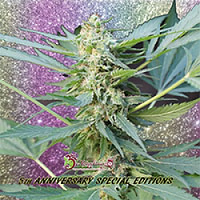 The high CBD Extreme is fast flowering and suitable for all enviroments and grow mediums making it one the most versatile marijuana strains. She will produce 2 types of Phenos...a sativa and an indica. Generally speaking the sativa pheno will produce lower yields but higher CBD, and the Indica pheno will have lower ( though still significant ) high CBD, and juicier yields. The sativa pheno is more suited to making extractions than to smoking and vaping, whilst the indica pheno is more robust and suitable for all ; whichever pheno you have, you will be rewarded with a medical marijuana strain second to none. The strong citrus / lemon tasting qualities are just the icing on the cake! High CBD of 20% , low THC of under 1% ...... truly the Messiah of all medical marijuana strains!